My sister gave me this recipe the other day and told me how easy it was. If she hadn't already made it and liked it, I would have been skeptical. She told me you make it in 5 minutes, let it raise for 30 and then bake it for 15 minutes. It just seemed to easy and good to be true. I was really excited to try it! 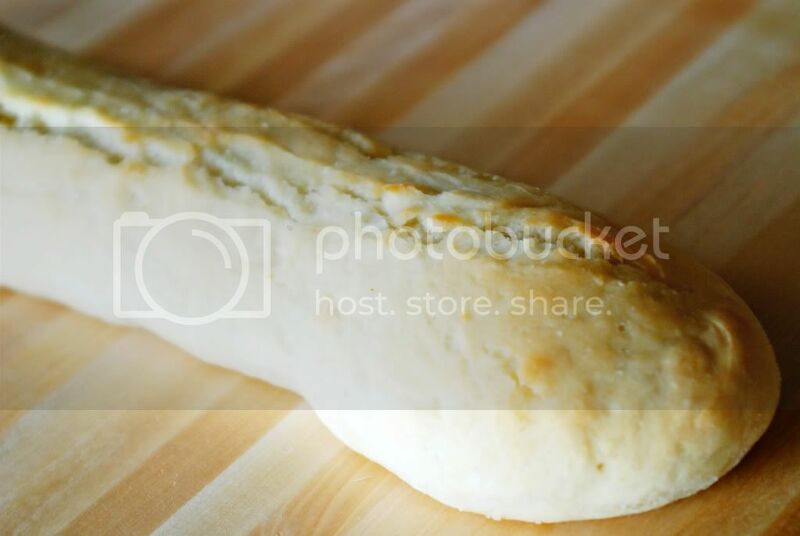 My baguette turned out so yummy! In fact, my children were HUGE fans of it. One of them even told me it was "The best bread I have ever had." Maybe a little bit dramatic, but I will take it! We had it for dinner and then I made the kids their sandwiches on it for lunch the next day. I will for sure be making this more & I think I will be teaching my 10 year old to make it. It really is that easy! Pre-heat oven to 450 degrees. In a small bowl mix 1/2 cup of the water with the yeast and 1 tsp. of sugar. Mix it well and cover with a cloth. In a large mixing bowl combine the flour, salt and 1 tsp. sugar. When it is mixed well, add the yeast mixture. Gradually add the rest of the water. Mix until the dough becomes a smooth ball. 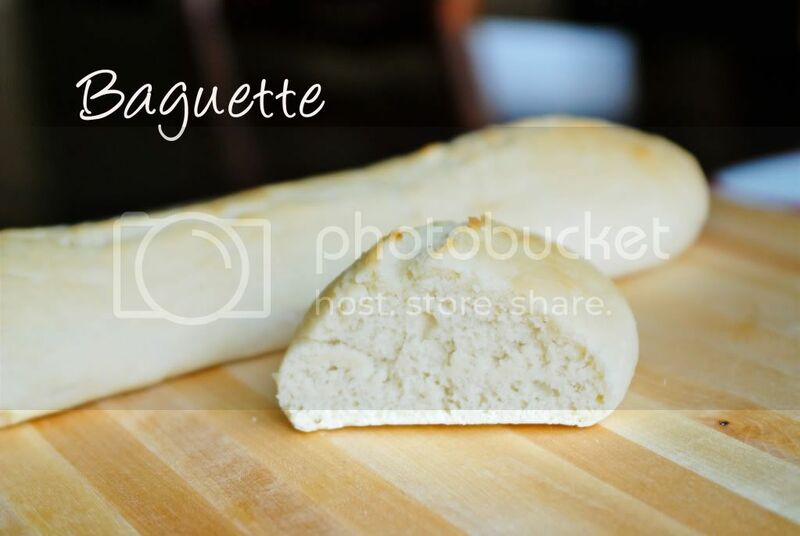 Remove from the bowl and knead the dough, cut in half and then shape into 2 baguettes. Take a knife and core down the middle - that makes it authentic! You can see, mine aren't too fancy. Put water in a cookie sheet and put it on the bottom rack of the oven. Bake the bread for 15 minutes. Half way through, brush the bread with butter. I really like the recipe for its low sugar content! You could try it with wheat flour also. Enjoy! So I made these the other day and they were fabulous - my husband says they are this favorite bread I have ever made! (and I make bread a lot!!) I'm making it again tonight! I want to feature this recipe on Sisters Cafe in a bit and I'll definitely link back to this blog. Your recipes are great! and I love the photography too! This looks so yummy!!! Could you please explain the "put water in a cookie sheet" sentence?? 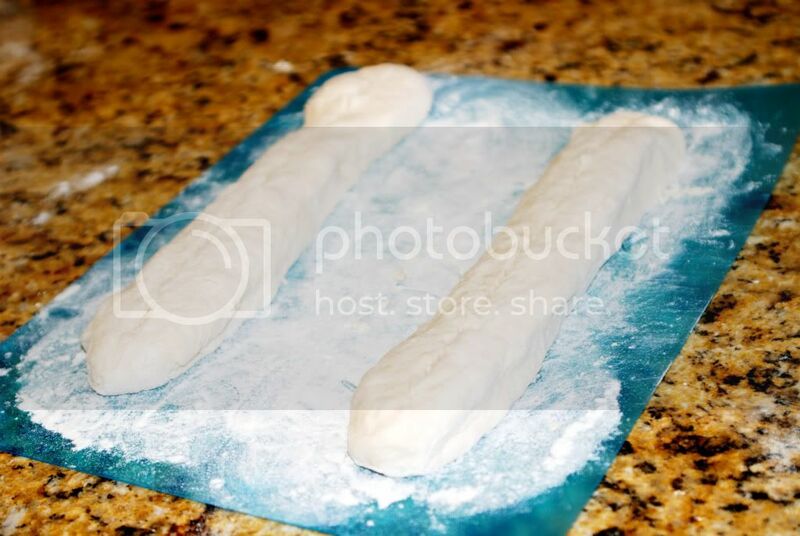 Do you just place the bread dough on a cookie sheet with a little water??? How much water?? Just making sure I understand the recipe so I don't mess it up. Thanks so much!!! Hi Carissa! Thanks for asking, I am sorry if that is confusing! What I meant was, put some water in a cookie sheet ( fill the sheet about half way up.) Then put it on the lower rack underneath your bread, which should be on the middle rack on a different cookie sheet. This allows the water to steam and rise up in the oven, helping the bread stay a little moist. Have fun making this bread, let me know how it goes!! Saw this over on the Sisters Cafe and I came to see the original post - looks great! I am going to make this tomorrow night. This turned out great! My new go-to bread. Easy and good - thanks for sharing! Thanks for letting me know Steph! I am so glad you like it! i love this! i made it with spaghetti the other night and i'm making it again tonight for a church activity. thank you!